The U.S. Capitol Rotunda is a large, domed, circular room 96 feet in diameter and 180 feet in height located in the center of the United States Capitol on the second floor. The Rotunda is used for important ceremonial events as authorized by concurrent resolution, such as the lying in state of eminent citizens and the dedication of works of art. 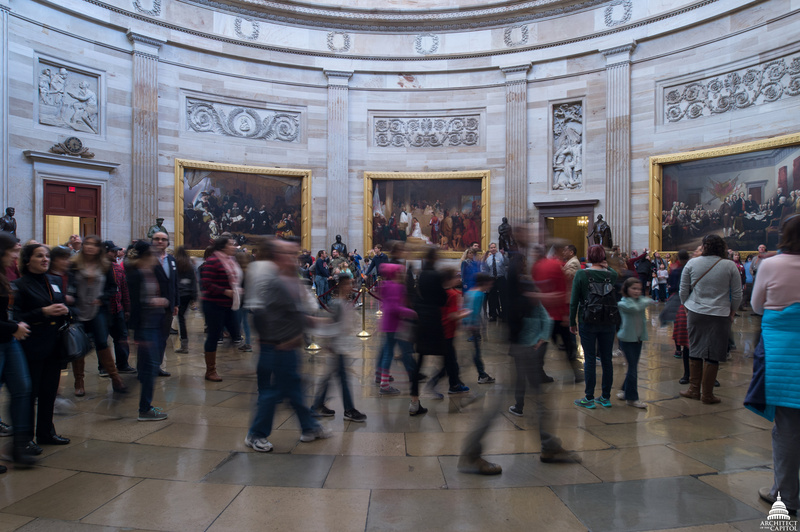 The Rotunda canopy features the painting entitled The Apotheosis of Washington, and the walls of the Rotunda hold historic paintings and a frescoed band, or "frieze," depicting significant events in American history. 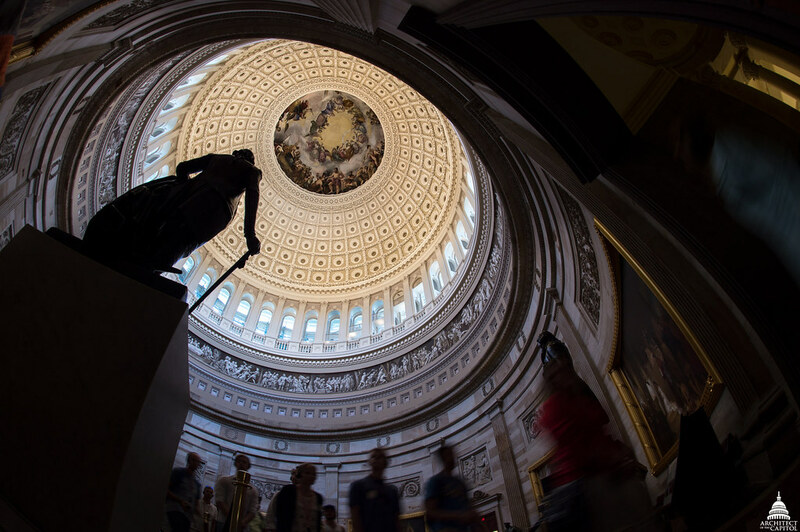 As it appears today, the U.S. Capitol Rotunda is the result of two distinct building campaigns. Dr. William Thornton, who won the competition for the design of the U.S. Capitol in 1793, conceived the idea of a central rotunda. Due to a shortage of funds and materials, sporadic construction phases, and the fire set by the British in 1814, the Capitol Rotunda was not begun until 1818. 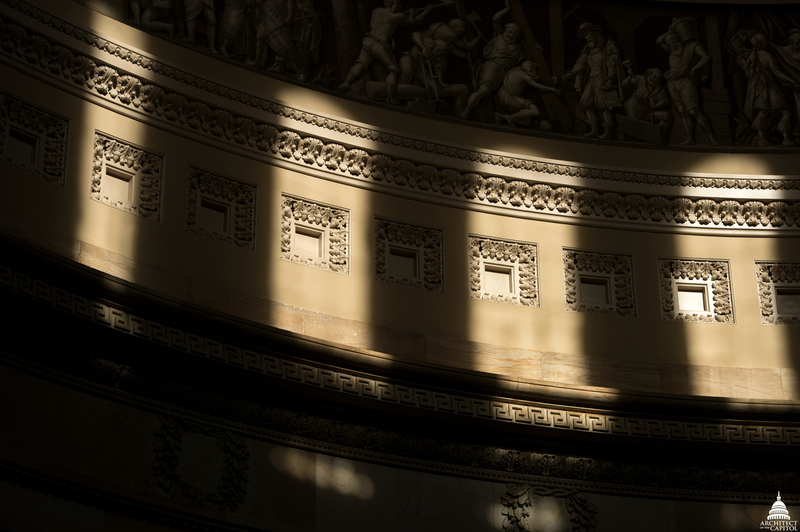 Sunlight shining in on the Rotunda's sandstone. The Rotunda was completed under the direction of Charles Bulfinch by the time of the visit of the Marquis de Lafayette in 1824. Conceived in the age of neoclassicism, the Rotunda was intended to recall the Pantheon, the ancient Roman temple. Bulfinch created in the U.S. Capitol Rotunda an ambitious orchestration of architecture, sculpture and painting. The curved sandstone walls are divided by fluted Doric pilasters with wreaths of olive branches carved in the frieze above. Framed niches hold large historical paintings. The sandstone walls of the Rotunda rise 48 feet above the floor. Everything above this line was added between 1855 and 1866 by Thomas U. Walter, who designed the north and south extensions of the Capitol Building. 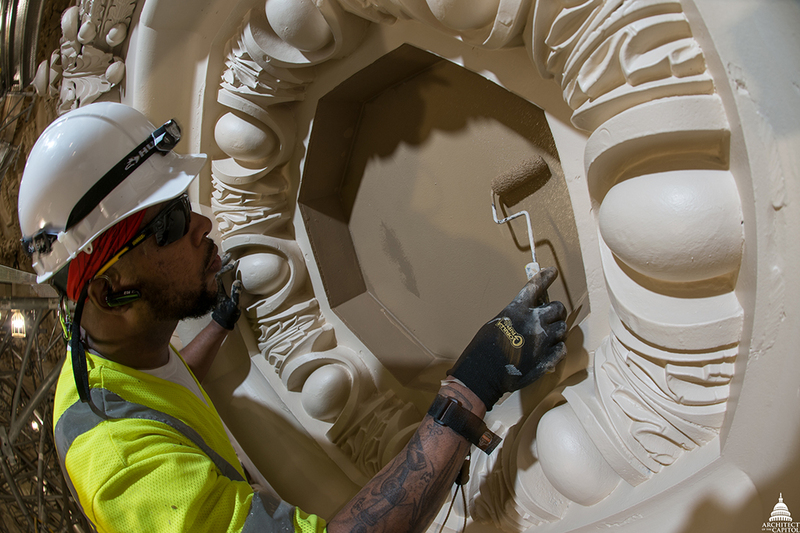 Congress authorized the new high dome of fireproof cast iron to bring the center portion of the U.S. Capitol into harmony with the large new wings. Walter's 1859 section of the new dome and enlarged Rotunda showed a fresco in the canopy over the eye of the inner dome and a sculpted frieze at the base of the dome. Constantino Brumidi painted The Apotheosis of Washington in true fresco on the canopy in 1865. The figures, up to 15 feet tall, were painted to be intelligible from close up as well as from 180 feet below. Partial view of the Frieze of American History. The frescoed frieze in the belt just below the 36 windows was painted to give the illusion of a sculpted relief. The scenes designed by Brumidi trace America's history from its discovery by Columbus to the discovery of gold in California, with emphasis on Spanish explorers and the Revolutionary War. Brumidi prepared a sketch for the frieze in 1859, but he was not authorized to begin work until 1877. After Brumidi's death in 1880, Filippo Costaggini was commissioned to complete the eight remaining scenes following Brumidi's sketches. However, when the frieze was finished in 1889, a gap of over 31 feet remained. The frieze was finally completed by Allyn Cox in 1953 with scenes of the Civil War, the Spanish-American War, and the Birth of Aviation. The statues and busts in the Capitol Rotunda are primarily of presidents, including a copy of a statue of George Washington by Antoine Houdon. The marble statue of Abraham Lincoln is by Vinnie Ream, for whom Lincoln sat. She was the first woman artist to receive a government commission. ​The sculpture in the Rotunda also includes representations of Alexander Hamilton, Dr. Martin Luther King, Jr. and the Portrait Monument to Lucretia Mott, Elizabeth Cady Stanton and Susan B. Anthony. Over time, water leaking through the Capitol Dome and into the building caused more than 1,000 cracks, damaging paint, cast iron, stone and decorative elements in the Rotunda. 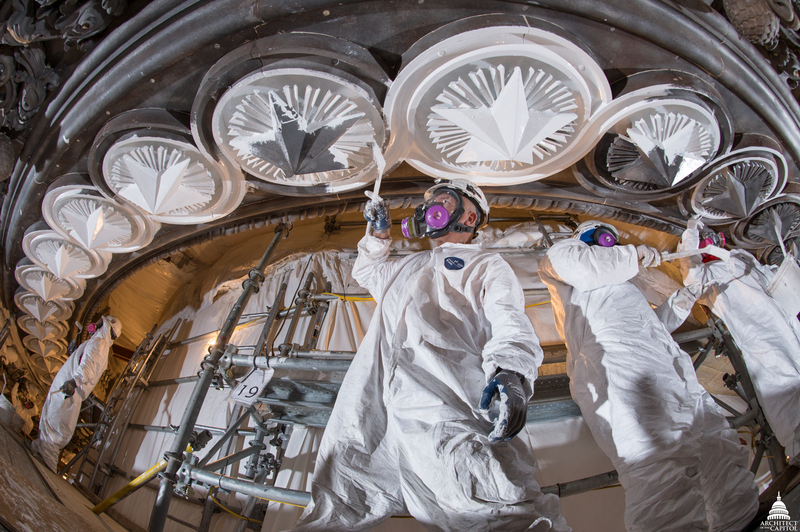 Beginning in July 2015, and throughout the restoration process, the Architect of the Capitol repaired ironwork, upgraded electrical and mechanical systems, installed new lighting, removed hazardous materials and returned the Rotunda's paint scheme to more historically accurate colors. 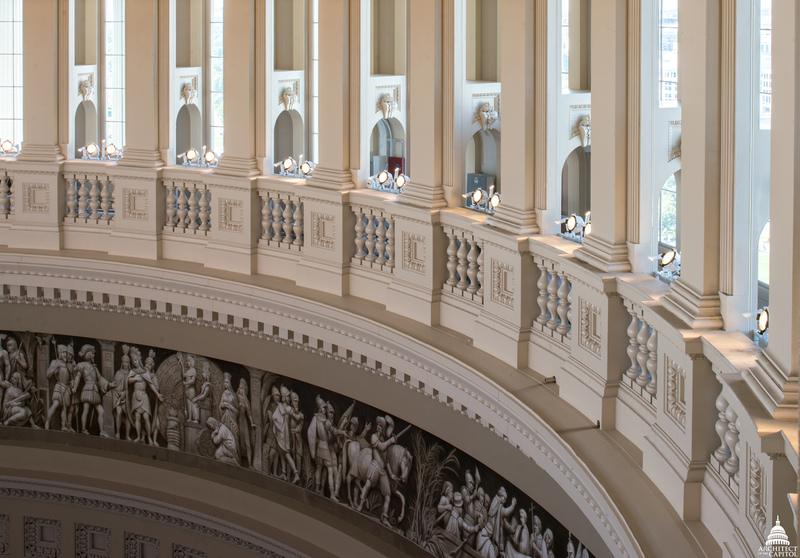 The restoration of the Rotunda ensures this hallowed space will be enjoyed by generations of visitors, staff and members of Congress for years to come.